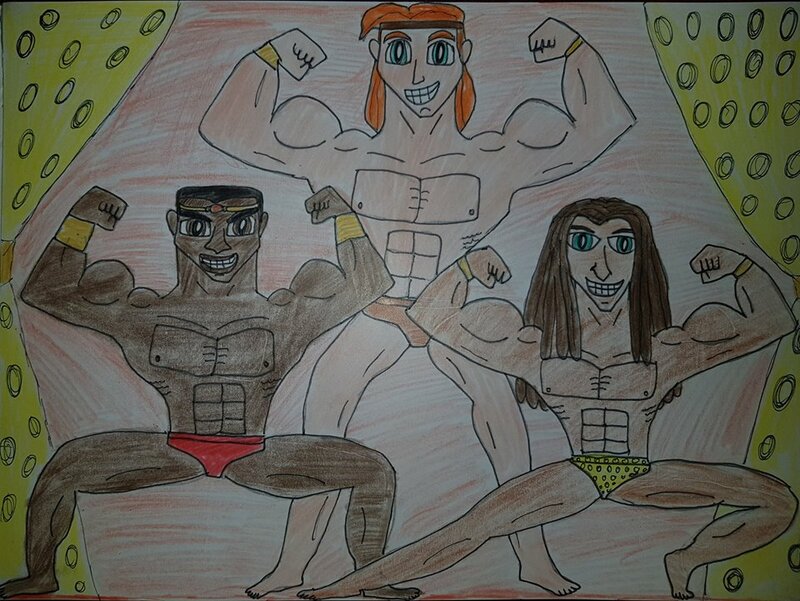 Ladies and gentlemen, I present to you all my three beloved Disney musclemen, Hercules or Herc from, of course, Hercules, Basuli from The Legend of Tarzan, and Tarzan from, of course, Tarzan, having a posedown in Opar. Aside Basuli and Tarzan being my absolute man-crushes of all time, Herc was definitely the one who preceded them. I remember even liking Disney’s Hercules ever since I was a little boy. Moreover, I was rather fascinated with Herc and how absolutely charming he was from his muscles to his charisma to the fact that Tate Donovan did such a phenomenal job bringing this character to life. Nowadays, as an adult, I still fancy him, even though his movie did have some flaws here and there. Regardless, Disney’s Hercules is still a rather enjoyable flick from time to time. I have always wanted to draw Hercules, Basuli, and Tarzan in one picture because I do feel like these guys can make an excellent three-man team with Herc being the leader and the overall big brother, Basuli being the proud warrior with his set of codes and Tarzan being the fierce fighter who saves his teammates’ behinds. I can even imagine them having the closest BroT3 bordering on OT3 bond ever because of how well they might work in battle and how well they deal with each other. In terms of relationships, as I stated before, I always see Basuli and Tarzan as brothers and when Hercules enters the mix I see him more as the childhood friend who always has their backs through thick and thin. If these guys were to be relocated in Ancient Greece, I am pretty sure these men would have some action together with the two jungle men sharing nights of intimate pleasure with their beloved demigod of strength. This kind of gives me an idea for an AU where Basuli and Tarzan are brothers who are brought to Greece from their native Africa to be trained as Hercules’s comrades in war. Little does Herc know, Basuli and Tarzan also have superhuman abilities like super strength, super speed, and even, the ability to communicate with animals. Thus, Herc feels a connection with them that he does not want them to be his slaves but rather his best friends and confidants akin to brothers. I can envision them training their muscles via weightlifting and even engage themselves in contact sports like wrestling, boxing, javelin-throwing, discus throwing, and probably their most favorite, Pankration. As time goes on, they will start to have feelings deeper than kinship. They might eventually confess their admiration and love for each other to the point where all three men strike a deal. Basuli will have three nights of passion with Hercules. Tarzan will have three nights of passion with Hercules. Finally, on the seventh day, all three of them will have a go at each other. I could really imagine these guys battling it out in the day and having their hours of passion at night. When their parents would inquire them about this, Hercules, Basuli, and Tarzan would staunchly say that they deeply care for each other and they are meant to be together and nothing they say will separate them. 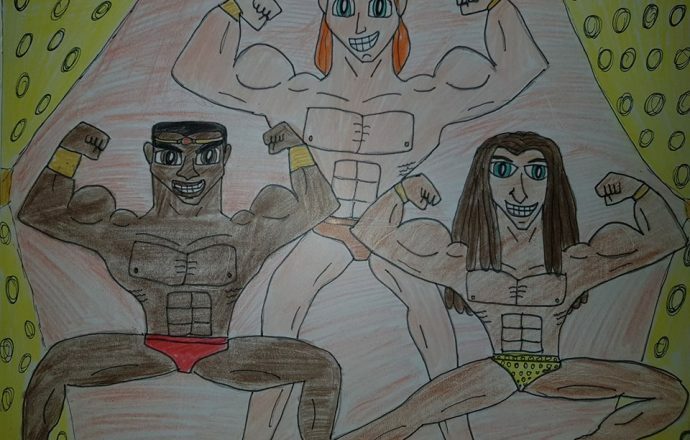 In terms of this drawing, I had to get the positioning, the postures, the skin tones of each of these gentlemen, and the setting pegged down to a T. I’m fully aware that Hercules has the lightest skin tone among his comrades, with Tarzan having a darker shade given his time in the jungle, and Basuli having the darkest shade of skin in comparison to Herc and Tarzan. Moreover, when it comes to muscle mass, Herc and Basuli are the bulky ones compared to Tarzan, who is leaner yet definitely has muscle. Out of all these facets when making this drawing, I had the most fun with the positioning and postures, as I was able to ensure that all three of these hunks are visible and, boy, was it satisfying. Plus, I find drawing Tarzan’s to be a slightly better experience than before. As for the setting, I sort of decided on a chamber in Opar complete with leopard-spot curtains and a reddish backdrop, enough to give anyone who views this exhibition a grand time with these three godly hunks. I hope you all enjoy this drawing I did and the post I wrote, as I did put some time and effort into this. Until then, see you on the flipside. Hercules belongs to Disney, and of course, Greek mythology. Basuli and Tarzan from Tarzan and The Legend of Tarzan belong to Disney and Edgar Rice Burroughs.